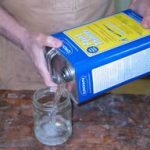 The trick to pouring solvent from a full or nearly full can without getting the liquid all over the place is to hold the can with the spout near the top rather than the bottom. With the spout near the top of the can, air can enter easily to fill the void left by the exiting solvent. You will avoid the “glug-glug” uneven flow caused by air breaking through the liquid to get inside the can.